What are the reasons customers give for choosing Sage 300 Project? The challenges faced by Construction and Engineering companies today are the uncertain market trends and emerging worldwide competitions. More and more Malaysian companies are moving forward to tap the huge global market for construction and engineering projects in neighboring countries. 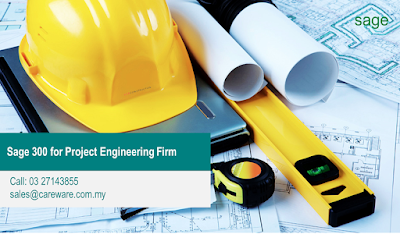 And yes, the oversea conglomerates are also setting up offices in Malaysia to compete with our local companies, for the Civil, M & E Engineering potentials, as our country embarks on growth and development. The Sage 300 Project Job Cost –is especially suited to the construction, project and engineering firm that need to track cost and monitor WIP, cost overrun, variation order, time & material cost, equipment and subcontractor etc. On the Project Accounting side it supports difference Income Recognition Methods and Retainage Accounts typical of project accounting requirements. d) Inventory and Job allocation. f) Flexible income recognition methods. G) Support retainage accounts, many more…..
We specialize in Integrated Project ERP Solution and have extensive track record and experiences. 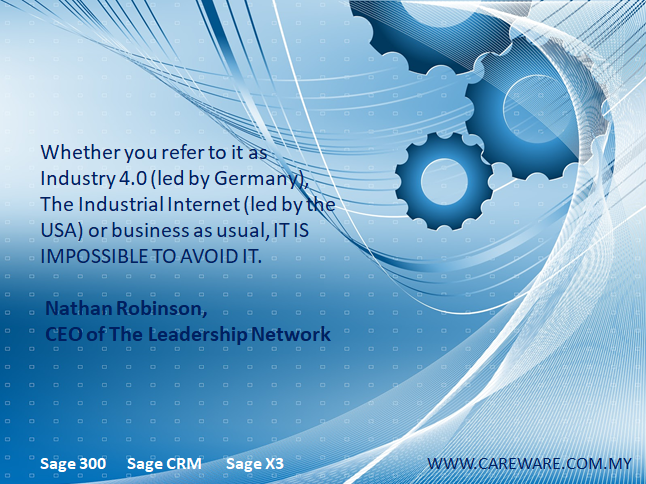 So if your companies are facing changes and are tied to a legacy ERP system and strain to keep up it is time to look at Sage 300 Project solutions. I talk to manufactures all the time and as I walk their factories I was hit with the reality that frankly in this region these plants have yet to fully adopt the automation technologies of Industry 3.0. Now they are hit with realization that the i4 revolution is upon us. In this environment, executives at manufacturing companies need to separate hype from reality. They need a clear picture of the current risks and opportunities. And they need to understand what their peers and competitors are doing to drive value and capture competitive advantage. At Careware, we want to help SMALL-MEDIUM MANUFACTURING organisations separate hype from reality. So, we sat down with you and talk about your concerns and needs. And very often we say go back to basic. Simplify your process and also strengthened your inventory accuracy. These are the FOUNDATION of your quest in it-lization. 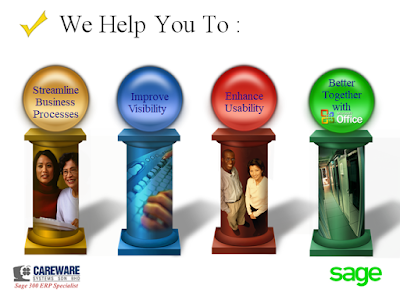 Select an ERP that is i4 friendly and compatible, that is affordable and that is fuelled by the current technology of cloud, mobility and business intelligent analytics, etc. The ERP is essentially central to your entire business process from sales order to manufacturing order, your supply chain and customer service. It is the backbone of the network connecting your business WITHIN and WITHOUT. It will connect to your production line via integration to your smart machines, robots, production cells, sensors and devices as products and as machines communicate with each other and exchange commands as products move from wip to finished goods along the production line. This is the end goal. The journey begins with the first step.